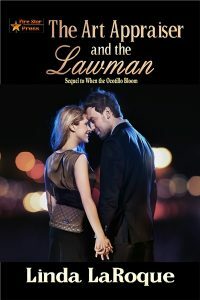 When Abby Devry, a Fort Worth art and antiques appraiser, meets a handsome Texas State Trooper, there is no way to ignore the instant attraction. Roark Espinoza has had his eye on Abby, and after one dance together, he knows she’s the one for him. But Abby hasn’t had much experience with men, and she’s worried about the dangers of Roark’s job. A lawman at heart, he plans to become a Texas Ranger as soon as he is able. Though Roark believes Abby is the woman for him, he’s haunted by wounds from a past relationship. When Abby’s job assignment sends her to inventory and appraise items in a beautiful historical home in downtown Fort Worth, Fate throws Abby and Roark together once more. The owner of the home happens to be none other than Roark’s grandmother, and he shows up to help with the project. As Abby and Roark work together, their relationship blooms, but it isn't until they travel to the Espinoza family ranch that Abby learns to believe her heart. When a murder takes place at the ranch, Abby’s faith and trust in Roark is tested. Is love in the cards for THE ART APPRAISER AND THE LAWMAN?